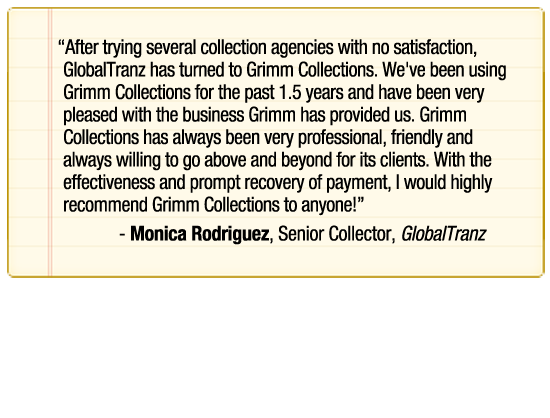 Find out why thousands of businesses, municipalities, healthcare facilities and others have chosen Grimm Collections over and over again for all their collection needs! 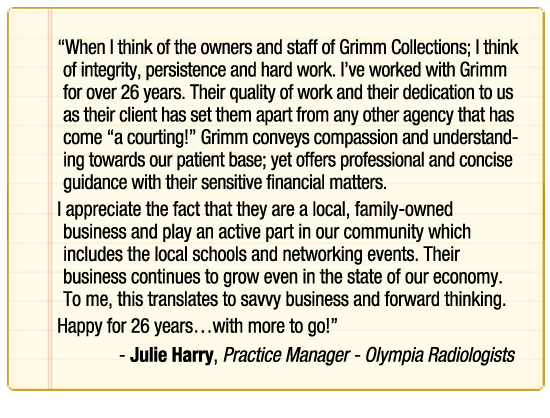 We moved to Grimm in 2010 and have never regretted it. 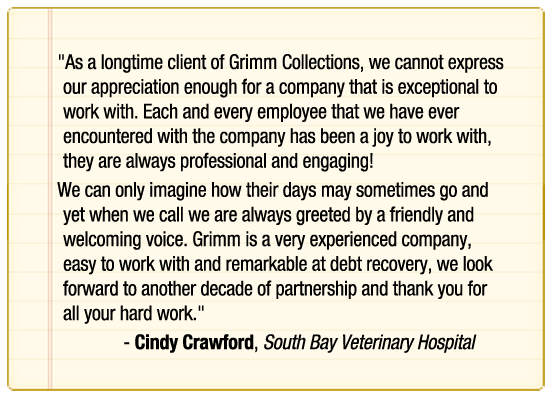 Since partnering with Grimm, not only have they collected 27% of our current accounts, they have collected 15.5% of the accounts that were previously written off by our former collections partner. They are friendly, prompt and always willing to work with us. We love Grimm! We have worked with Grimm Collections for over twenty years and they do a super job for us. 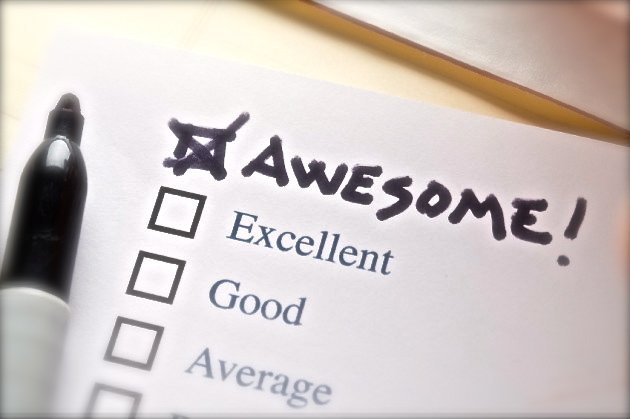 The service they have provided to us over the years has been friendly, cooperative and flexible. We appreciate their professionalism in working with not only us but our clients and it shows in their successful percentage of recovery. JJ Child, Rodgers Kee & Pearson, P.S. 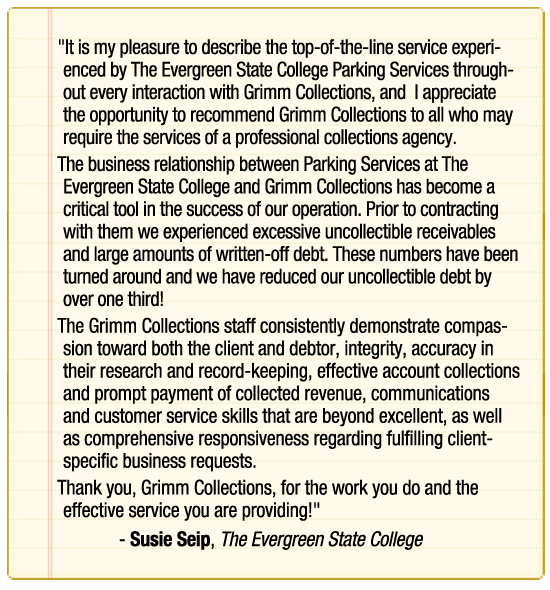 The business relationship between Parking Services at The Evergreen State College and Grimm Collections has become a critical tool in the success of our operation. Prior to contracting with them we experienced excessive uncollectible receivables and large amounts of written-off debt. These numbers have been turned around and we have reduced our uncollectible debt by over one third!